welcome to therapy » I’ve got goodies! Goodies you say? Did I get your attention? If you weren’t already aware, today is National Scrapbooking Day (NSD). A day where folks all over the world get to sit around scissors and tape runners in hand, sniffing paper and creating masterpieces. Ok maybe that’s cutting paper – am I the only one who sniffs the new stuff? And in case you didn’t know there is a blog hop going on in honor of NSD with the Sassafras Lass team. We’ve all created something new to show off the goodies that you might win by simply leaving a comment. So visit each team member’s blog and leave a comment. If you’re going in order, head to Megan’s next! The more comments you leave, the more chances you have to win a prize package worth $20 – fun right? The giveaway closes on Monday, May 9 at 9:00 p.m. EST so be sure to visit all the blogs and comment by then. The winners will be announced early next week. Have fun and Happy Scrapping! Oh what a wonderful page! I love it! Love this layout, love the journalling on the side to offset the photo, great project! I love your work!! Happy Scrapbooking Day!! Very cute! Loving seeing the products! Oh my gosh, this is amazing. I love the fun little colours and all of the layout. So sweet! Gorgeous layout, I love the stitched frame! Such a fun page and adorable photo! Ohhh these are my fave type of layouts….lovin the grid and this is nsuch a sweet photo. Also love the way you ahve yhour title and journaling!!!! Love the grid and the vertical element on this layout! Such a stunning result! Great job! LOVE THIS! Love the different square tiles and all of your journaling! What a beautiful page!! I love the design!! Wow, gorgeous page! Happy NSD! Cute – love the grid pattern! I like the simple clean lines. LOVE the design. Darling pic. Warms my heart. Love your layout. I really like the blocks of bright colors. I sniff paper too so don’t feel bad 🙂 Really liked your lo! I love this page!! And what a cutie pie in the pic. 🙂 Happy NSD! LOVE this! I will definitely pin this in pinterest!!! Thanks for sharing! I absolutely LOVE this layout! The colors and design just pop right off the page! Thank you for the inspiration and Happy NSD! super cute layout! love the title! I just love the Sassafrass papers! Can’t wait for the new line. Love what you did here! I’m really going to need to make a page like yours! It’s adorable!!! Lovely LO! BTW, I love to take a sniff of my new paper as well so now you aren’t crazy! LOL! Thanks for the opp. Happy NSD! Your layout is adorable! Sweet photo! Love the paper! Great page. Am loving the grid. This layout is so cute! Love the colors! Such a lovely layout. The B&W photo goes so well with the bright colored pieces of paper. oh my gosh how cute. of course, you CANNOT go wrong with sassafras lass! it’s always been one of my faves. i sure am enjoying the blog hop on nsd! Your LO makes me wanna scrap the afternoon away-LOVE it! TY for the inspiration! Love…LOVE this layout so much. So adorable and cute!! Ow, I really want to lift that one, if it is ok? LOL i’m a sniffer!! love your work! This layout is simply adorable! I love your design and the elements that you used. Congrats! Super cute layout! I love the colors & the sweet photo! Love your layout!!! very cute pic. TFS!! This LO is beautiful, love the colors and the title ! I have a weak spot for grid designs. This is perfect! Beautiful layout! Love the design! love love love the title on here and all the journaling. What a great page, love all of those squares of paper crush goodness! I love your layout- great title! That is an adorable layout! Super sweet! Awesome work! LOVE it! And love that picture. How how CUTE!!!! beautiful…such a fan of the white background…with those colors! Terrific page – I love it! Love this! Such a sweet layout! Just a darling design and a darling pic! I always have such a hard time chopping up my sassafras paper… I just love it in all it’s bold goodness- but this LO is a real inspiration to get out my trimmer and punches! Luv the colors…so beautiful. TFS!!! I just love your layout. Thanks for sharing. Oh my goodness! This would have to be one of my favourite layouts so far…. just so pretty and well balanced! How cute! Thanks for a chance to win some goodies! That’s so sweet. 🙂 Thanks so much for the chance to win! love it! happy NSD! sassafras is absolutely my fave scrap company! One word – ADORABLE!!!!!!! Thanks for shaing! Love your bright, happy page! aw, such a sweet pic and LO. love your stitched frame! Super cute layout, love the photos and the layout! Thanks for the chance to win! What an adorable face! I love your blocked layout ! Love your layout! Happy NSD to you too! Love the grid pattern. Great lo. so cute I love this page–great job! awwww!!! Perfect!! Great frame to pull it all together and fantastic combination of colours! Absolutely love the colors on this! Super cute you make these goodies finger licking good! The way you used the “Love” journaling card is awesome, as is the yellow strip of pp along the side of your grid! Happy NSD, thanks for the chance to win some sass! This gives me so much inspiration. Thanks for sharing! I love the block-style layout! And the photo is beautiful as well!! Oh I so love sassafras, awesome awesome awesome! I love the colours on the white and such a stunning design. Happy NSD! So cute! Loving this Sassafras inspirational goodness! Love this!!!! It’s just perfect! Darling layout! Love the bloghop Idea! That is just the cutest little layouts! I LOVE it! Thanks for sharing! I love all the pieces!!! What a fabulous LO!!!! Love your work. Thanks for the inspiration. I love the grid design on your page! Beautiful! I love all the squares! I love your beautiful page!!! This is such a sweet layout! What a cozy and cute layout! oh so cute!! love the colors. thanks for the chance to win and hope you had a great weekend!! What a lovely page, and a great thing to document. I miss those snuggle days! Love all the squares of different patterned papers! Really showing off the Sassafrass- gorgeous! Just fab!!! thanks for sharing us and for the chance!! Love your grid design and the use of so many diff papers didn’t overwhelm the B&W photo of you and your darling baby! Love your LO design..very fun colors! Those colors are just beautiful! Love the picture too!! Great layout. I have a snuggle bug too. Thanks for a chance to win. Love your layout – what a cutie! I’m loving this blog hop – so much inspiration! Thanks for a chance and have a Happy Mother’s Day! Love, love, love your layout. Can never have too much Sass. Thanks for the chance to win! Fun layout! I love the colors! Super cute layout! I so love the design with the little squares of patterned paper – it lets you show off more of those awesome Sass papers! So cute 🙂 thanks for sharing your gorgeous page!! 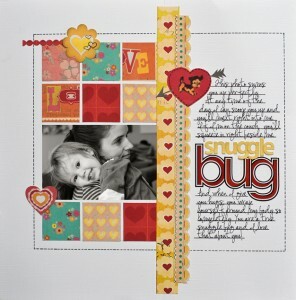 What an adorable Snuggle bug layout! I really love this sketch! And your daughter is so cute! LOVE the layout and all the little squares! I’m totally lovin’ this layout, I just might have to try a quilt design too. It looks so colorful and balanced. I love goodies! Thanks for the chance to win! What a cute layout! I love the red and yellow you used! I love the layout and the jounaling! Baby on Happy Earth Day! Sharyn on I’ve got goodies! Jen Cuthbertson on I’ve got goodies! Marian on I’ve got goodies! Elena on I’ve got goodies! Michelle M. on I’ve got goodies! Kate C. on I’ve got goodies! Copyright © 2019 welcome to therapy.